Toward the end of last September, Jocelyn and I were still relatively new to Boulder and wanted to explore. The aspen leaves were in season and we were in search for some golden foliage. 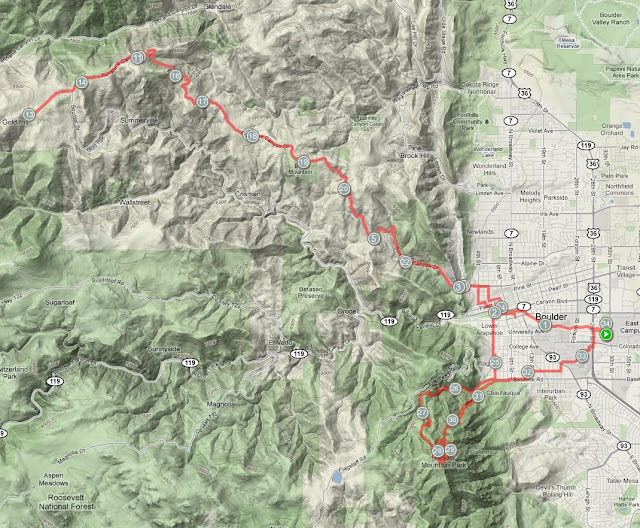 With this in mind we ventured up Boulder Canyon to Nederland and the Peak to Peak Highway and then headed north. We were also vaguely looking for some dirt on which to run, so we pulled onto the Gold Hill Road and meandered down it until it intersected with the Switzerland Trail where we got out and enjoyed a leisurely hour autumnal jaunt through the trees and cool air at 8500'. Frustratingly, that was the absolute maximum my knee could handle at the time. For the trip home, however, we continued east on the road, stumbled onto the tiny, idyllic near-ghost town of Gold Hill and then continued home via Sunshine Canyon. Even after it turned to asphalt half-way down the descent I vowed to come back and run this road once my knee was healthy. Well, today I finally decided that my knee was capable of taking on the 10 mile, 3000' descent that a return trip from Gold Hill requires. Today was another magnificent +60F spring day in Boulder, but the forecast was for more snow tomorrow, so I was eager to get out and spend as much of the day as possible running the hills. 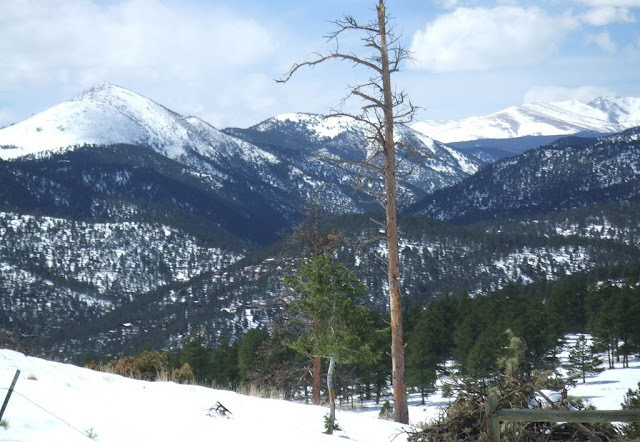 Additionally, most of the Boulder Mountain Parks peak trails are still either annoyingly slushy with unstable footing or under a foot or more of snow. So, today seemed like one of the last few logical days of the snow season to go pound a road for several hours. Of course, I wasn't going to let Green Mt. go unnoticed, either, so on my way up to Mapleton Avenue and the mouth of Sunshine Canyon I stashed a pair of Microspikes in a hedge in order to assist me in my end-of-run climb. The climb up Sunshine Canyon Drive is one of those mostly reasonable mountain ascents. From the corner of 4th St. and Mapleton it is 10 miles and 3000' of climbing to Gold Hill. I had come across a recorded time of 1h38min by Galen Burrell on Bill Wright's old Boulder Trail Running Records site. According to his site, this time was for the 10 miles from 4th St to the 10 mile marker in Gold Hill. I had no idea how stout this time was but do know that Galen was/is a very strong runner, so used it as a benchmark for how long the run should take. Even with the first ~6 miles being asphalt, this is a pleasant run. Traffic this morning was moderate to light, and the gradient is occassionally broken by short sections of flat and even slightly downhill running. Running up a sustained, constant hill like this is something that is significantly different from the steep, technical, switchbacked, stair-stepped climbs I've become accustomed to on Green Mt. this winter. 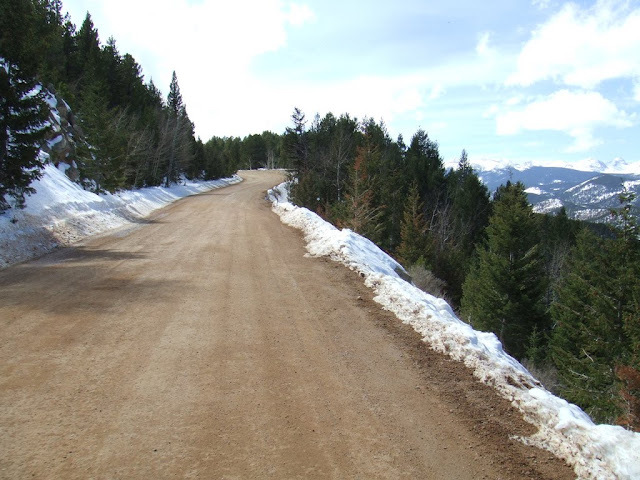 On the road you can maintain a legitimate running stride the entire time, but the featureless surface gives one a sense of ascending very slowly. As a result, the mind tends to wander and dissociate a bit from the attendant effort. Being a weekday, it was hard for me to not think about how fortunate I am to be living a life where I can duck out the door and go running in the mountains for nearly five hours on a Monday morning. Granted, I'm in the middle of CU's Spring Break, but it was only natural to have the collective topics of work, careers, values, and priorities marinating in my mind. I was once sitting outside of a coffeehouse at a sidewalk table when a man walked by with a tattoo on the back of his head--like where there is usually hair. One of the folks I was sitting with made a comment (to me, not the man) about how that sort of thing pretty much precludes one from becoming a "contributing member of society". Okay. In this particular case, that may have been true, and tattoos on one's scalp may be a little...something (full disclosure: I have no tattoos)...but, whether or not my companion was right wasn't what interested me about the statement. Instead, then--and this morning--I was more fixated on the entire concept of being a "contributing member of society" (CMOS). I'm not sure what this means. I'm pretty sure I know what my coffee companion meant: securing a job where tattoos are taboo (i.e. typically one with a substantial salary and plenty of "upward mobility"), and using the acquired money to generally follow what are by and large the rules of modern life. I think we all know what those are. Don't think that I'm denigrating the concept of making money. I'm not. Earning a living is completely necessary. But, I'm still not sure what I think constitutes "contributing" and whether or not contributing in the sense my companion was insinuating is even a value worth harboring. For instance, grinding my way up Sunshine Canyon Drive, engaging in this singularly selfish activity, I found it difficult to convince myself that I was contributing anything to anyone, yet I was profoundly satisfied, present, and, for lack of a better word, happy. Was that bad? Was I being irresponsible? Am I being irresponsible? Being irresponsible seems inherently undesirable. Don't get me wrong, I think I completely understand the common values of family, community, love, being kind to one's fellow man while expecting nothing in return, etc. The value of those concepts--given the proper motivations--seems virtually unassailable in my mind. The issue I've been grappling with, rather, is whether there are other equally noble, valuable modes of being a CMOS that, metaphorically speaking, have no concern with whether or not one has a large, visible tattoo. The way I usually come at questions like those is by considering the more alternative ways of contributing to society, which by definition usually involves something non-corporate and maybe even non-governmental, which also means that the way we've come to assign value to things--monetary compensation--is also typically lacking. I'm talking here of the creative activities in life: music, art, writing, etc. Depending on the day, I consider working the land (farming, in a particularly conscious manner) a very creative (maybe the creative) mode of contribution. Lately, I've also been thinking about the act of running as a creative process, perhaps a very particular type of performance art that, if occassionally shared with others through racing and other collaborative efforts qualifies it as a contributory activity of some value. That is, of value to a society, the kind of value that isn't typically assigned a dollar amount. But, I'm certainly not sure. My hunch is that there is a precarious balance somewhere in between the two end-members of, A) resource-sucking leach on society, and B) capitalist greed-monger, that affords one both satisfaction and virtue. 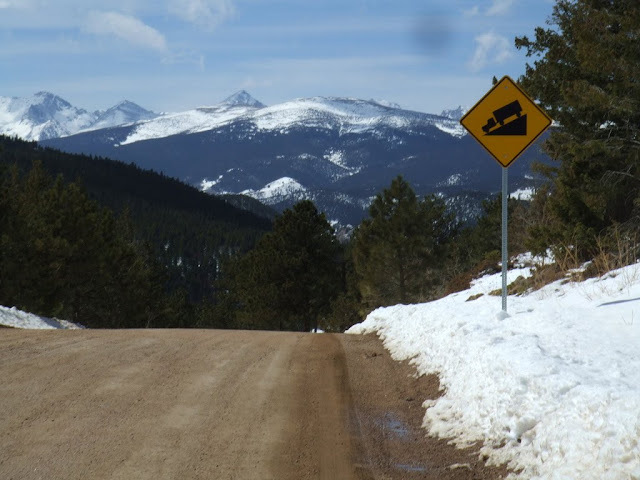 The incredible views of the foothills and looming Indian Peaks eventually distracted my mind, though, and before I knew it I was at the top of the climb and cruising down the 1/2 mile descent into Gold Hill. 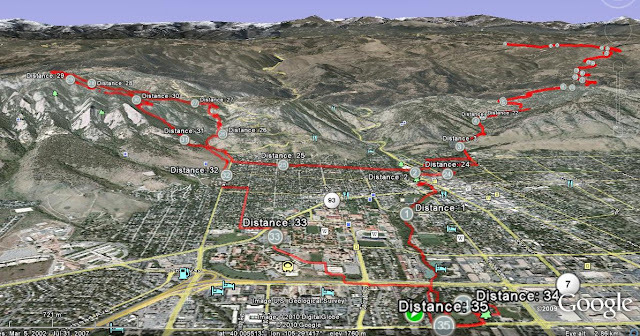 I'd reached the corner of Sunshine Canyon Drive and Gold Run Road (turns into Fourmile Canyon lower down) at the entrance to Gold Hill in 1:23:50 from 4th Street down in Boulder. 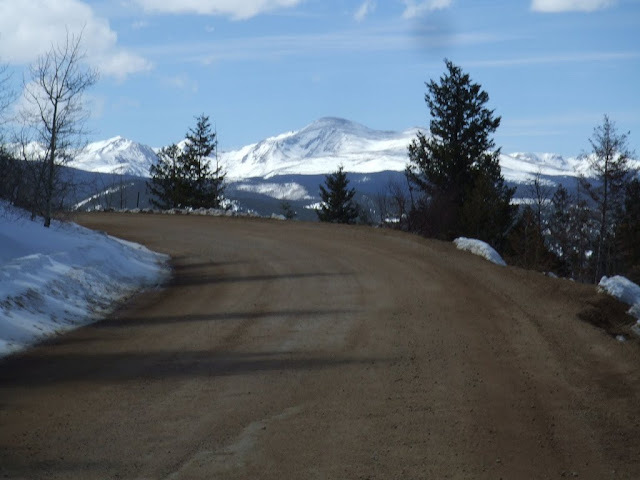 Curious about Galen's time, I continued up Main St. Gold Hill with my eyes peeled for the 10 mile marker, but ran all the way to Colorado Mountain Ranch on the far edge of town before giving up on spotting it. The snow on the side of the road must've been too deep. Based on the 9 mile marker, I would guess that it's ~0.4 mile/3min past the Gold Run Rd intersection. My effort today was easy/casual and I could easily see myself going 30 seconds/mile faster with some focus and motivation, so I'm gonna go ahead and surmise that Galen wasn't exactly pressing that day. The 10 miles back down to town passed in a quick 66 minutes, and with the pop of a Blueberry-Pomegranate Roctane I started the final climb of the day up 6th Street to the Gregory Canyon trailhead and my 86th summit of Green Mt. Green was hard today. By time I'd reached the trailhead my body was already begging for another GU, even though I'd had one only 20 minutes earlier. The trail through Gregory Canyon was predictably clear (astonishing considering the amount of snow on it just 48 hours earlier), but the Ranger trail was in the unsavory state of not-quite-slush, not-quite-solid-snow that transformed the stride and cadence of my already pounded and bonking legs into a fairly pathetic baby-step shuffle. Certainly good rehearsal for an arduous late-race climb. Forty-five minutes after the summit I was back at my apartment and scrounging in the kitchen for food. It was already early afternoon and all I'd accomplished today was to make myself very, very tired. But, for the moment at least, that seemed to be enough. Your writing this blog is contributing to society as you demonstrate and show people through words and actions what life is all about. The freedom and the beauty of nature. Being both in it and present at the same time. We don't have to be conventional to be contributing. I think the unconventional is the best form of contribution, because it is different...something the world needs more of! mmm let me see...Inspiring efforts. Creative musings. Challenging thoughts. Leading light of the community of trail runners worldwide. These are just a few of the great contributions from you Anton - and they're all appreciated a great deal. Thanks! Talking about Switzerland trail; you ever considering coming over to europe for a race? Do you follow the european ultra/trail/mountain running "scene"? What do you think about Kilan Jornet and his "Kilians Quest"? If you get a chance, read Vollmann's Riding Towards Everywhere. He's not talking directly about being a CMOS, but I think there's probably a lot there. One of your best yet. I've had that exact conversation with myself many times about the value of my running. Conventional wisdom is usually not wise at all. A tremendous amount of good comes from simply not doing harm. I've never found myself doing any harm to myself or others while out running. I think you inspire people to run, and that certainly contributes to society, especially since you combine your race performance with this blog. As for the man with the tattoo on the back of his head where usually there is hair - I have to disagree with your friend. Perhaps if he had a tattoo on his neck, maybe I could go along with it, as those are pretty hard for people (especially men) to cover up. But it seems rather easy to cover up a tattoo on the back of one's head where usually there is hair - grow some hair! Then contribute away! I think those fortunate enough to be able to spend hours a day running, biking, hiking, climbing, etc., in general, probably live in a society where there is relatively easy access to food, water, and employment (money). Being that these resources aren't a given for people on the planet as a whole, I believe those that do have them should work a bit harder than it would take to just 'get by' in order to make more resources available to those with less access. Granted it may take many years to get to the point where one might contribute substantially in this way through professional ability , financial gifts, or time, but I believe this is a responsibility of the fortunate among us. So a CMOS would need to be a CMOS where S includes the planet and not just developed societies. I'm not saying I've really contributed much at all up to this point, but this is what I think I should do. Have you sucombed to using a Garmin? Tony, I found your thoughts on being a CMOS interesting because I am currently reading Dr George Sheehan's "Running Life" and he is ruminating along a similar line. Thanks all for the comments/perspectives. I'm absolutely interested in running in Switzerland: UTMB obviously, but also the Haute Route from Chamonix to Zermatt. Definitely know of Kilian. Your point is one I'm largely in agreement with, but didn't touch on in my post. I've been privileged enough my entire life to obtain/pursue an education and live comfortably enough where I can even engage in (let alone obsess about) such frivolous activities as running, thus, I absolutely feel an obligation to "give back" or positively affect my surroundings in some way. I'm not convinced that developing nations are where my efforts should be focused, but that has more to do with personal interests and motivations than the obvious inherent good that would come of that. It's all very complicated, and sometimes I think I think about it too much. Come on! You know me better than that! No, that's simply manually mapping the route in MapMyRun, which then automatically creates a .kml file you can open in GoogleEarth. And, map geek/geographer that I am, I'm a huge fan of Google Earth. From having been a self declared CMOS, I get in conflicts of selfishness when I run or hike in the mountains of British Columbia all day. I got very sick in my mid 30's (am 40 now) and had to flip my life upside down. I now have a beautiful garden, cook most of my food from scratch, and read Zen and Eckhart Tolle. I experience happiness when running and think it is more of a overall presence of being. My dad pushed me to be an extreme outdoor guy and then a workaholic. We all run with baggage too. Awesome post Tony! You continue to inspire us through your blog and running to extend ourselves. See you on the trail. Thanks for contributing to making my day better! "A tremendous amount of good comes from simply not doing harm." With some rationalization, bigger concepts seem to fit into one of these three. Very nice post. Walt Whitman would spin thoughts in big circles ("What's my place in the universe?") and little circles ("If I kill this bug, what will his family think?"). The thinking and consideration are in themselves productive. If more people did it, the better we could be, CMOS. Nice one Jerry. I guess what you are saying is: while death is assured we must not forget to live. I have been one of those corporate, money making, alleged CMOS for 20 years. Believe me it has been a dry, passionless road. As I have gotten older the value I place on money and material things has reduced significantly. My focus in recent years has been far more on my family, community and my environment. My running has always been my passion throughout my life and when I look back over the years, the satisfaction I get from running memories far exceeds those from my corporate career. I admire farmers, firefighters, nurses and emergency volunteers far more that I do bankers or stockbrokers (most of who are bloodsuckers on society rather than CMOS' anyway). By focusing on what you love doing you will continue to inspire and enhance the lives of those around you and that, for me, is what being a CMOS is all about. Just remember to give a little back to running as well. Bit of trail maintenance or manning an aid station never hurt. In 1992 I was working as a drug rep when I bumped into Bob, a fellow rep, who was looking dashing and unreasonably happy. "What's up?" I asked. "That was my last call. It's over," he said as he jumped up and clicked the heels of his Italian leathers. Bob was 63 and had been a successful drug rep all of his working career. I congratulated him and asked him what advice the old sage had for the naive young man. His reply has been repeated over and over in my mind and in my journals: "Because I was good at selling drugs I own boats, cars, houses, art, land, and lots of things called 'stuff.' But for all of that I passed on truly knowing and loving my wife and children, being available to help my family and friends, and being active in my community. Now I get to go and meet my grandchildren. So, what can I tell you? Don't fail yourself and those close to you like I did. Collect many esperiences, shared memories, and interests and few objects. And smile a lot because you are doing what makes you AND everyone around you happy." At that time I was selling drugs as a tranfer between being a successful industrial chemist to being a teacher. Nothing noble in mind, only happiness. Bob's words helped me to see that it was more than MY happiness that mattered. Thanks for the conversation in Pbville (PB) and the insights in your blog, Anton. You are certainly a CMOS - not to mention a BAMF in the ultra world. 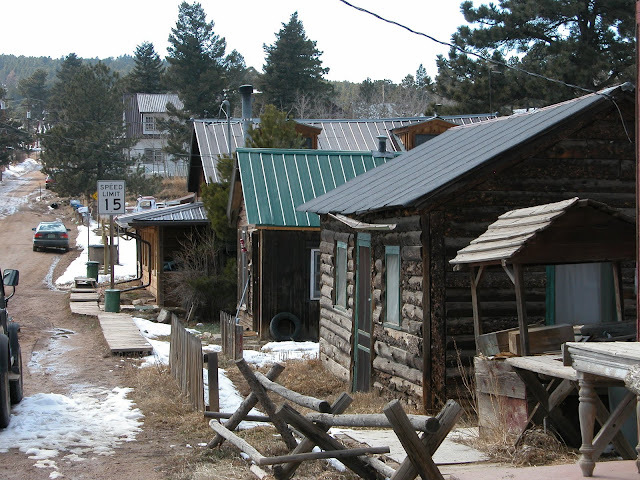 Is Gold Hill on the EPA's superfund site? I mean you should know these things Tony. such long and taxing distances they answer a call from the deepest realms of their being -- a call that asks who they are ..."
John, great story. The absolute most fulfilling things in life are free and easy to obtain. By the way Anton, I agree, you can add BAMF to your credentials. Sorry John, I was referring to Shane's story. Shane's story reminds me of an interview I read in Forbes. The person was a retiring billionaire of a Fortune 100 company. When they asked him what he was going to do now (and I will never forget this) he said he hadn't had much free time over the last 50 years so he was looking forward to getting to know his wife and kids. That one paragraph changed my life. I realized that he missed the boat and that his wife and children had lived and moved on without him. I decided then and there that my needs (including my family) would come first. Life is about balance, but you must know your priorities to maintain the balance. From the looks of it my guess is the guy at the coffee shop would have said Gold Hill is a non CMOS town (if there is such a thing). From the looks of it I am with you "my kinda town". Raised platforms to keep folks out of the mud (who needs sidewalks) and if I am not mistaken those are hitching posts in the foreground - gotta love a street that has parking for horses. Poetic and germane- there is certainly a stream of consciousness similar to Robert Pirsig in your writing. There seems to be a theme extolling the virtues of some sort public service- I love the NGO theme. In any regard, what you are doing is extremely important, as you are an already serving as an ambassador on many fronts. Just a question, How to combine running with physic studies? Tough questions. I find myself getting very frustrated when I start thinking about how little I am really doing for others/society/our world. But it is those very thoughts that give me some hope...at least we aren't going thru life without asking such questions of ourselves and challenging ourselves to re-assess what we are doing and why. Keep it up, and let me know when arrive at the perfect answer. Great post, and really great comments. This is undoubtedly a valuable contribution to society. I’ve struggled with feeling selfish about my running. I resolved earlier this year to focus my running obsession on helping others. I have no illusions about solving all the worlds’ problems; my “contribution” is exceedingly small. But I’ve never been happier and more fulfilled. Sharing what you love to do, to the benefit of those less fortunate, is the way we were meant to live. Thanks for running, blogging, and ...contributing. Running is not and never has been(also it never will be) "Frivilous". *Frivolous*...My bad, i'm even at school right now and I still spelled it worng. The engagement rings of Monique Lhullier is a dream come true, and fit into the concept of wedding dresses 2013 collection by Monique Lhullier.